When? An evening in June. What? A chic secret picnic for 10,000 diners in an iconic Paris location. Where? A secret location in Paris. 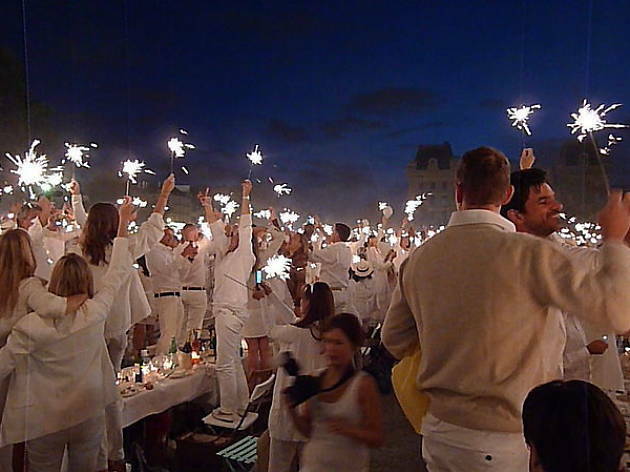 Every June, 10,000 picnic-goers dressed all in white descend on a famous Parisian landmark, only revealed to guests at the very last moment. 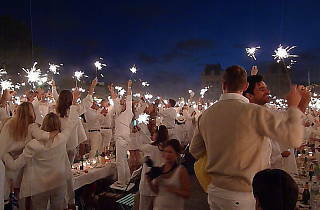 Founded by François Pasquier in 1988 as a gathering for a large group of his friends in the Bois de Boulogne, Dîner en Blanc has grown year upon year, taking place in some of Paris’s most elegant and historic spaces, including the courtyard of the Louvre, the square in front of Notre Dame and on Pont Alexandre III. Emphasis is, predictably, placed firmly on ideals of decadence and elegance, with invitees required to bring tables, white tablecloths, china tableware, and of course, an extravagant array of food and drink – on a scale to match something Rabelais might have dreamed of. Despite granting no formal permission to the festivities, police usually turn a blind eye to the Dîner, safe in the knowledge that each year revellers usually tidy up pretty well after themselves. Places for the event are highly sought after, thanks to a strict invite-only policy. So if you haven’t got an invite yet, the best tip is to simply to ask around and see if anyone among your friends has already bagged themselves a place – Paris isn’t that big a place, after all. Details for the 2016 event will be closely guarded until the night itself, but we suggest you stay tuned to the event’s website and facebook page.